Guitar Play-Along Volume 49. By Stevie Ray Vaughan. Guitar Play-Along. Play Along. Softcover Audio Online. 88 pages. Published by Hal Leonard (HL.699725). ISBN 0634074520. 9x12 inches. Book/Online Audio. Songs: Couldn't Stand the Weather • Empty Arms • Lenny • Little Wing • Look at Little Sister • Love Struck Baby • The Sky Is Crying • Tightrope. ; a mixture of the rhythm and lead parts. So, no second guitar parts are included. 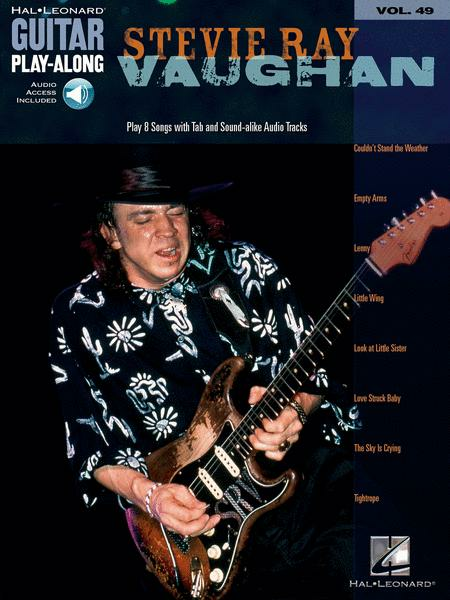 Actually, for an SRV book this works, since there is usually just one guitar track. While the tabs may be simplified, some of the songs are very intermediate (and higher) in nature. Remember...he's copying Hendrix on Little Wing.